I have been teaching tapestry to adults for almost 50 years, both in the United States and in South Africa, where I lived for seven years. Teaching children in grades K-8 in a school environment has been a very different, enjoyable, and rewarding challenge. I have found there are age specific projects within the school curriculum that enhance the learning experience and enthusiasm for tapestry. In 1994 I was approached by an adult tapestry student of mine, a principal of a Los Angeles public elementary school, to see if I might be interested in teaching weaving and possibly tapestry to her classes, K-5. Before that time I had only taught weaving as a volunteer in my own young son’s 2nd grade class. It was quite a daunting task as I would be mostly alone with 20 to 25 students for 45-50 minute classes throughout the day, moving from grade to grade. After the first year of trial and error with class management and age appropriate learning possibilities, I was approached by a parent association of another school who had heard about my classes and wanted me to teach at their school as well. Since then I have taught weaving and tapestry during the school year and at summer camps that were privately organized or in public schools or art centers. The students include kindergarten age through high school children, as well as adults (including teacher training classes). I have also been the all-around art teacher in those schools, camps, and art centers. the program has a small material cost. In the school system I start the K-2 grades with a basic notched cardboard loom. Weaving is done with a 6” plastic needle using various yarns, metallic fibers, and textured materials, including found natural elements such as thin bamboo sticks, bark from trees, other plant forms, large feathers (Peacock eyes are great sticking out of the selvedge edge! ), leather strips, fabric strips, paper strips with words, and anything else that adds texture and color. I also bring in examples of different fibers, e.g. cotton plants, samples of many different animal fibers, silk and silk worms, etc. and explain where they come from. When I am sure that students understand what they are doing, the looms stay in the classrooms. Teachers find it beneficial to allow students who are finished with other work to reward them with free time on the looms. I usually display the students’ final weavings on the cardboard looms, so they are stretched and somewhat framed by the background of the loom itself, which is sometimes decorated as well in art class. By the third grade the students know how to keep their edges straighter, how to join wefts together, and are proficient in the under/over rhythm and focus. They also know what warp and weft are and what weft-faced weaving is, as compared to plain weave and warp-faced weaving. That’s when I change the looms so that they can progress with a more efficient and more mechanical loom. 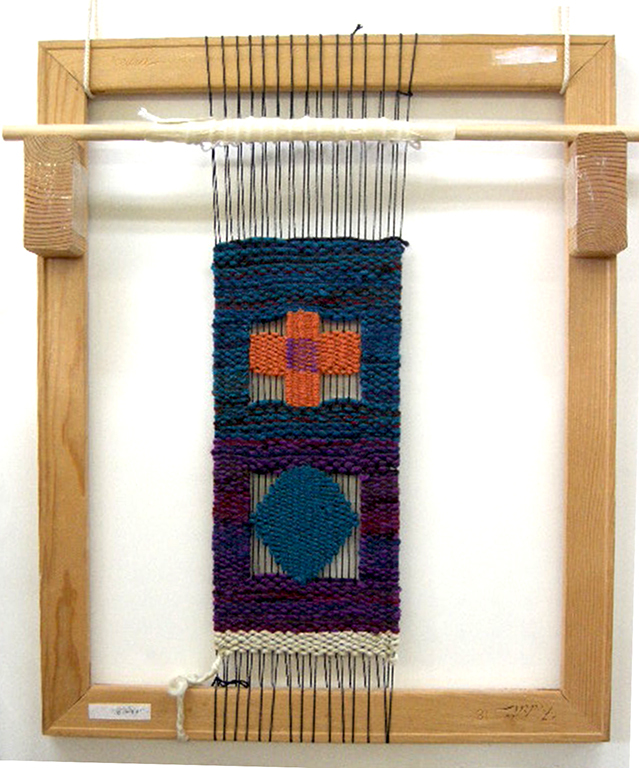 I have designed a simple, inexpensive frame loom 18” wide by 22” tall with a heddle stick that can be used year after year and can easily be stored in the classroom during the 6 to 8 weeks that the weaving projects usually last in each class. In one school I made over 120 of these looms that were then used for over 15 years. The loom has also doubled as a frame for teaching silk painting (using a quarter yard of silk) and in other art projects. By third grade I start talking to students about tapestry and the history of tapestry in other cultures, with slide shows, samples, and pictures of some of my tapestries with my 15 foot wide loom. I also demonstrate how to make different simple shapes with slits and simple pick and pick. To demonstrate I find it best to use an open warp technique so that the shape can be concentrated on without thinking about background or negative space. (See photo below.) Using math and symmetry, counting warps and wefts, drawing the image on graph paper, transferring images to computers in their other classes, and talking about pixels, etc. integrates the project to other aspects in their education. This also coincides with a discussion about the history of Navajo weavings, kilims, Persian carpet designs, etc. In one school I pushed for an extra project for a 3rd grade class with a very encouraging teacher. The class held a competition. 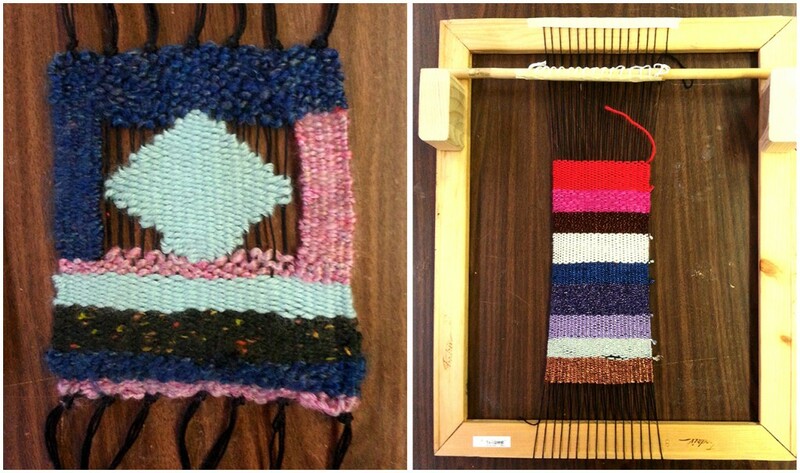 Each student designed a 2’ x 3’ tapestry weaving that showed a basic cultural living environment. All of the students created paintings that they thought would be simple to weave. One design was chosen by voting and for the next several months, once a week, I arrived and pulled 3 to 4 students at a time out of class to weave the full tapestry, which ended up being hung permanently in the auditorium. The students in that class were very proud! And I was so thankful that the teacher knew how important this learning experience was for his students. In fourth grade, using the same small heddle loom, I teach how to warp the loom using a figure 8 warping, make continuous heddles on the heddle stick, start the weaving, and design a simple design. I talk about what makes a design too complex, as students want to go all out, but then get discouraged if it is too difficult. It’s important to get them to design something that is simple enough to be finished in the time allowed so that there is a feeling of accomplishment. Simple designs are so much more rewarding when they are completed! Again, slit technique for straight vertical lines, etc. are used. Fourth graders are able to help me warp looms for the third grade classes. I often have after school volunteer times with fourth graders to help me warp all of the looms for the students in the 3rd grade. Volunteer parents and teachers who want to learn also join in. At this point some parents (and teachers) purchase extra looms to have at home for their children or for their own projects. I am often approached by parents, teachers, and members of the administration to teach classes after school. 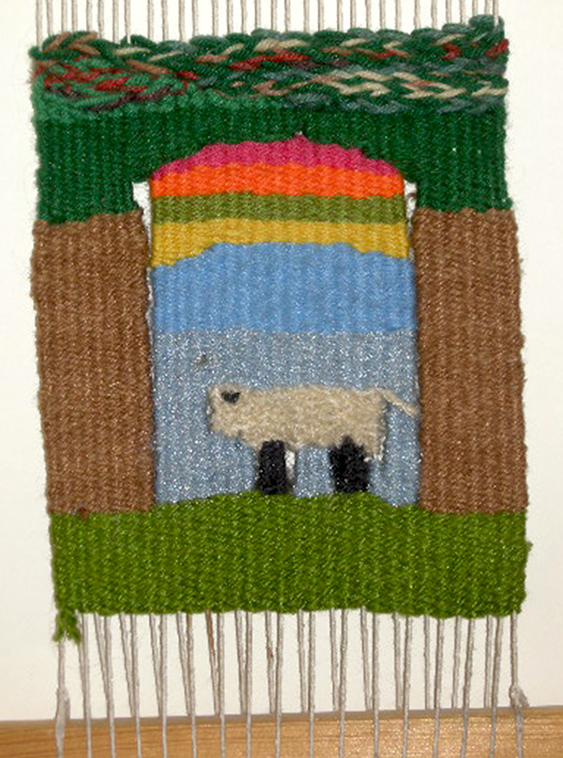 One of my after school classes included a school secretary who finished a beautiful tapestry that she entered into a competition in her synagogue where it won a first place award. The tapestry was then displayed in a show in Washington D.C. This was woven on the same loom that I use with the students. I use the same loom for beginning adult tapestry students, which they can use later to sample techniques, warp sett, and weft blends. Fifth grade students (and older) who have had the past grade weaving experiences, are able to progress with their designs, weft interlock techniques, color blending, use of texture, etc. One of the most popular designs that fifth graders weave is their name. If that is their passion I have them weave it sideways, in “bubble” letters, with slit technique and a border. They draw the design in a cartoon first. If they aren’t interested in weaving their name, I encourage them to weave a simple landscape, abstract shape, or a graphic Navajo inspired design. They can also come to me for other ideas for simple tapestry designs, in line with the possibilities, expertise, and time constraints of the project. In summer camp I have a time limitation and a mixture of age levels. I use simple weaving with texture and found natural elements for the weaving, except with the older children, who I encourage to weave a simple image. 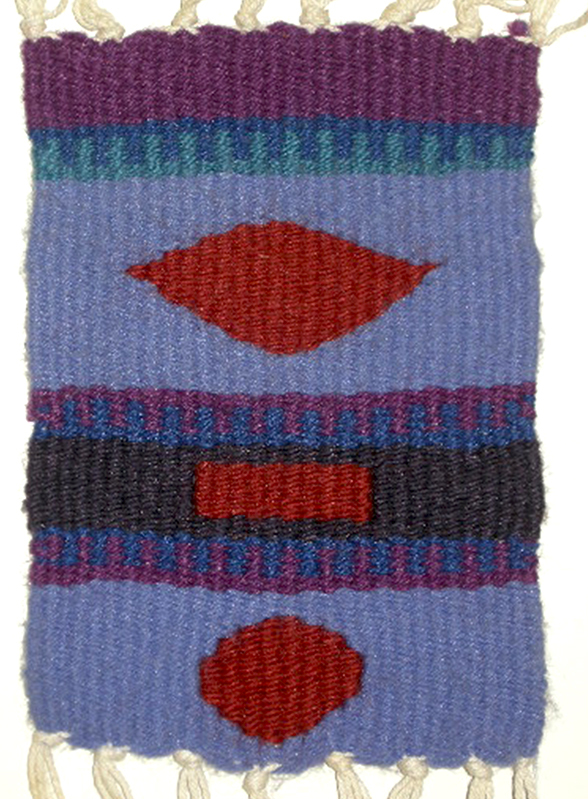 Middle school students progress to weaving a sampler of techniques and then they design a small tapestry using at least 2 of those techniques, integrating principles and elements of design. The looms can go home with the students, which allows more time for completion. I often see students with their looms outside at lunch or after school weaving together. Weaving is frequently listed as the favorite art project during a school year and when I see students years later, weaving and tapestry are enthusiastically brought up in our conversation. 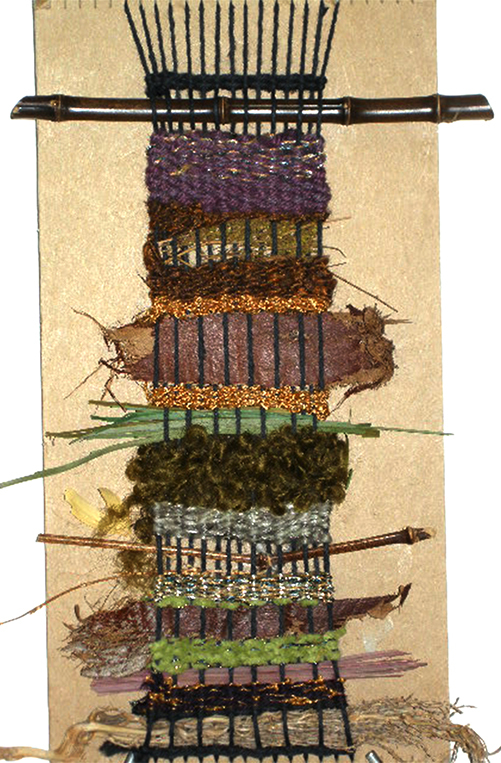 Hands on weaving classes are a great way to create a generation of students with a love and appreciation of contemporary tapestry and other fiber arts.